Put bike in fifth gear. 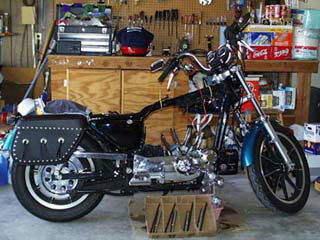 The remove carb, exhaust, tank, etc. per engine strip-down instructions in the FM. I removed the exhaust in one piece as suggested by Rickko. In order to remove the rear the rockerbox, you'll need a shorten allen wrench or a rocker box wrench (Like the one I have). To remove the intake manifold, you'll need a shortened allen wrench (like the one I have) or a ball allen wrench (I've heard this works). Reason for these two special tools: Those socket head screws are in incredibly tight space locations. 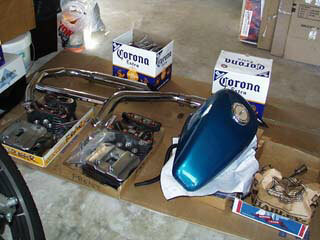 To remove exhaust in one piece, unbolt the mufflers from the frame (front) and bracket (rear). Unscrew the socket head screws attaching the exhaust pipes to each of the cylinder heads. The whole exhaust comes off in one piece. Why fifth gear? Well, you want to make the lower rocker box removal to be easy - you just roll the rear tire (I just rolled the bike) to make sure that both the intake and exhaust ports are closed on the cylinder you are working on. This releases pressure on the rocker arm that you are working on. I drained the oil when I did the cams. 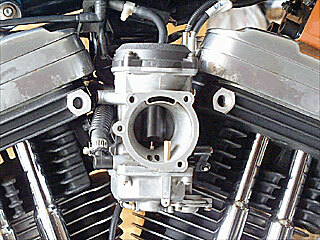 The Sportster is stripped of engine parts down to the case. The cylinders were shipped to DWR Race Support in Arizona for honing and selection of matching Wiseco K1700 series pistons. The push rods and tubes are in the foreground. Below the screwdrivers in the background are the CV carb and ignition module (and Arai F/F helmet). I used a small flat bladed screw driver to pop the retaining ring off of the pinion pin (wristpin). Now I have two very expensive cigar ashtrays (pistons). The cigars can be stuck in the wristpin holes to hold the stogies. The pistons are out and the cylinder studs are protected with 0.5" ID plastic tubing. The base contact with the case is almost cleaned. The tappets have not been removed at this point. Old socks keeps crud from falling into the case. To remove the rocker boxes, put in fifth gear and see that intake and exhaust ports are closed on the cylinder you are working on. Makes removal easier. Parts be parts. I have parts in labeled ziplock bags. For example, the front motor mount and all its hardware is in one "Front Motor Mount" bag. BTW I will mill out the slots on the front motor mount to accept the hardware for the Thunderstorm heads. On the left are the rear and front standard XLH1200 heads, rockerbox covers, and all associated hardware. The exhaust came off as one piece - ala Rickko. The Corona boxes are empty of the precious fluid but full of baggied parts. 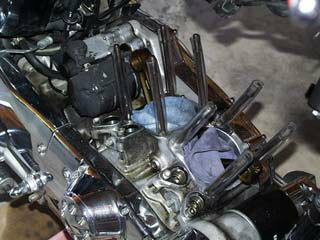 Remove the tappets after removing the tappet pin plate and pins. I used a Craftsman magnetic pick-up to lift up and remove the tappets (Thanks Moshe). I completely submerged the tappets in clean oil making sure that the tappets went back to the same holes (Front Exhaust - FE, Front Intake - FI, RE, RI). Drain oil and remove oil filter. Remove the cam cover. First remove the timing covers and gasket, sensor plate screws, sensor plate (disconnect the ignition sensor connector), rotor bolt, and rotor. I really ought to change the cam shaft oil seal also. Then I removed a hose that connects to the cam cover. This allowed me to remove the cam cover without it dangling from anything. Remove the cam cover. I unscrewed the 11 screws in order of the torque sequence. 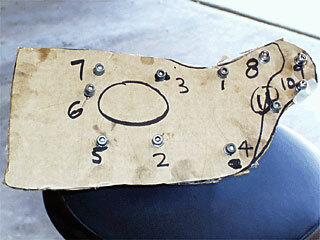 Before you start removing the socket head screws, make a cardboard cut-out of the cam cover. You see, the cam cover screws are not all the same so when you remove a screw, put it in it's appropriate place on the cardboard cam cover cut-out. I drained the oil prior to cam cover removal. Couple of things: (a) some oil will drip out (b) make sure bike is in fifth gear for cam gear alignment. At this point, you may choose to see that the cam timing markers are aligned according to the FM. I chose an alternate approach. A magnificent piece of art, eh? It'll eliminate a lot of heartache later. With this crude method, you'll know where all the appropriate screws go on the cam cover. This is great advice given by Maurice. This cardboard cut-out is labeled with the torque sequence. 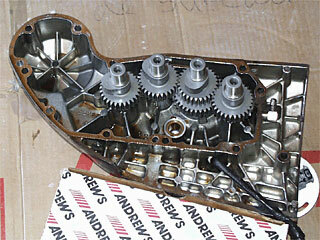 Checking the new Andrews N8 cams for fit as recommended on the Andrews Products homepage. 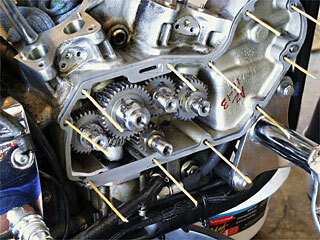 By placing the cams in the cam cover and rotating each cam gear, you can check for any binding or looseness. It's a nice simple check and gives you a feel for how precise the gears are. Ok, the four cam gears are removed from the case. 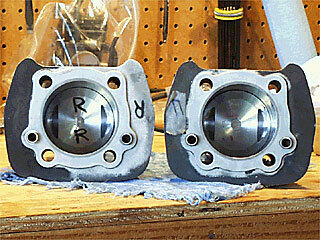 From left to right, the cam bushings hold cam #1, #2, #3, and #4. The gear sticking out of the crank case is the pinion gear. It has a timing mark which is an indented mark on one of it's teeth. That marker is used to align with the timing mark of cam #2. 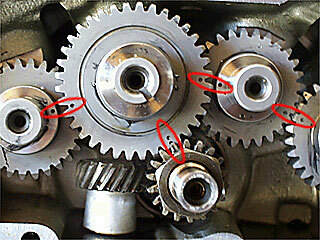 If you've pre-aligned the gears, just remove cam #4 and replace with new; Remove cam #2. Remove and replace cam #3. Remove and replace cam #1. Replace cam #2 making sure the timing markers are aligned. I did not pre-align so did not follow this procedure. There is one timing marker on cams #1 and #4, two timing markers on cam #3, and three markers on cam #2. I installed as follows: Remove all old cam gears. Cam #2 must be removed before #1 and #3. Use lots of assembly lube on the shafts (I also put it on gears). Install new cam #2. Rolling the bike (rear wheel) back and forth, align one of the cam #2 timing markers to the pinion gear timing marker. Remove cam #2 and install cam #1 then #2 so that the cam #1 and #2 timing markers line up (a cam #2 timing marker must be aligned with pinion gear). Remove cam #2. Re-install cam #3, then #2 (but not all the way in). 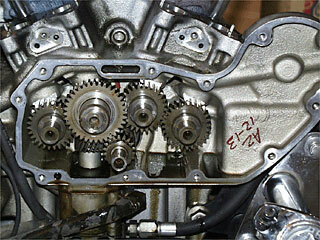 Adjust (rotate) cam #3 to match timing marker on cam #2 (a cam #2 timing marker must be aligned with pinion gear). Push in cam #2 all the way and then install and align cam #4 timing marker to a cam #3 marker. Viola! Now put lots of assembly lube on the cam gear shafts that will go into the cam cover bushings. Wipe the cam gasket surfaces clean. Use wooden skewers to mount up the gasket. Remove all but a few skewers on top and place cam cover on, using the skewers for alignment. Use half of the 11 screws to secure the cover back on and then remove the skewers. Put remaining screws on and tighten to 80 - 110 in-lbs following the torque sequence. 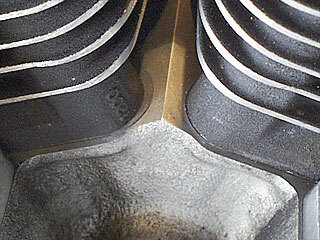 The base is cleaned and ready for cylinder installation after installing the pistons. I used a non-scratch nylon pot scrubber (with water), old credit card to scrape, and VERY careful low angle application of a single-edged razor with VERY little force to lift stubborn gasket material off of the case. The cylinders were bored for 0.020 over-bore by DWR due to out-of-roundness, excessive taper, and small scratches on the wall of one of the cylinders. So they matched the 0.020 Over Bore with the K1702 pistons. They also set the rings for me. Be sure the pistons are appropriate for the cylinder and appropriately aligned - The exhaust port direction is marked on K1702 pistons. The preferred way as written in the FM is to install the pistons on the connecting rod, position base gasket, and using a piston ring compressor on lubricated rings, slide the cylinder down onto the piston, guided by the cylinder studs. 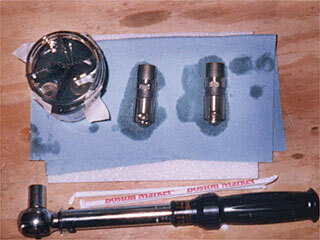 Make sure you use a well lubricated ring compressor that "comes apart" - like the one you use for VW's. PEP BOYS has one for under $11. I broke my ring compressor... You can bust out laughing now... So I did it the Tatro/Rickko way. Turn cylinders upside down. Assembly lube the first 2-3 inches from the top of the upside-down cylinders and lubricate remaining part of the cylinder walls with engine oil. The place the rings in the proper orientation as shown in the FM - basically the ring gaps are pointed at the cylinder stud holes. 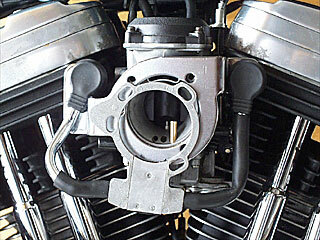 Install one retaining ring for the wristpin in each cylinder. I installed on what is to be the tappet side. 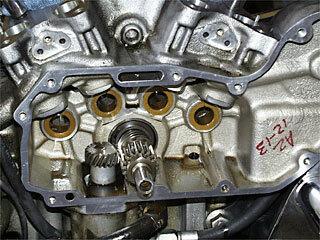 Turn pistons upside-down, place it on the upside-down cylinder, resting on the first (compression) ring. Squeeze the ring and place the ring gap in the cylinder. Gently work the remainder of the ring into the cylinder. Repeat for all rings. I did lightly tap on the pistons with the palm of my hand to press the pistons in the cylinders - it's a snug fit. DON'T PUSH THE PISTONS ALL THE WAY IN. Leave the wristpin hole on the pistons clear. 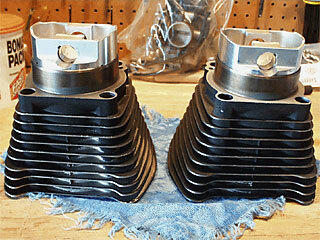 Now we're ready to install each piston and cylinder combo. Place the base gasket in its place. I used the HD base gasket since (a) it has print-o-seal so no messy Hylomar (b) there is a small lip where the crank case halves meet so I figured the fiber HD gasket might seal better than the Aluminum Bartel's gasket - very subjective. Slide the cylinder-piston combo onto the cylinder studs, align and install the piston on the connecting rod with an assembly lubed wristpin. Install a retaining ring. I pushed the end of the ring opposite the gap into the piston retaining ring groove then used needle nose pliers to push the two ends into the gap. BTW: I installed the first wristpin retaining ring on the tappet side so that when installing the piston-cylinder combo, I wouldn't drop the ring into, say, the tappet holes! The front Thunderstorm head. Note the combustion chamber. It's not a hemi like the stock XLH1200 heads. Instead, it's a bathtub shape. Also check out the pretty valves. 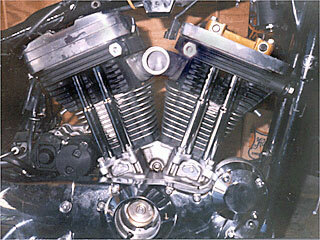 The valve springs are heftier too since the the heads are design for 10:1 compression. Basically, it's a better quality 1200 head. 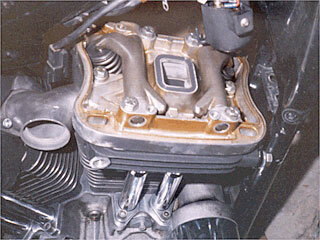 The rear base gasket is placed and the rear piston/head combo is installed. There are two ways that I installed the pushrods/down tubes. 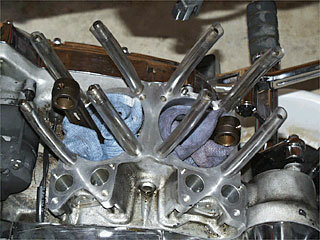 At any rate, shown are my rear (exhaust and intake - left and right respectively) tappets. On left is the jar full of oil with quadrant dividers that held the tappets soaking in fresh oil - you can see the two remaining tappets submerged in oil. Torque wrench (the clickity-click kind) at bottom. Also straws for my margarita glass - since my hands were greasy. At this point, gently drop the tappets into their holes. It only orients one way, as the tappet pins will not go in if it's oriented in the wrong way. The rollers should allow for rolling motion front to back of the bike. So the two ways of installing the pushrods and tubes: Method one (Rickko's) is to install the pushrod tubes (with pushrod seal) before installing the heads. I did this for the rear cylinder. Method two is per FM: Install the cylinder head first, then install the pushrod tube by tilting the tube and pushing the top end into the tube hole in the head, then sliding the bottom onto the tappet hole. Make sure that you slide one the pushrod seal and other hardware over the pushrod tube prior to installing the tube. There is one minor modification necessary when installing the Thunderstorm heads. They use 7/16" threads on the front upper motor mount instead of 3/8" like the stock heads. I widened the slots with a milling machine in the front upper motor mount. Instead of using a stud in the left front like the stock bikes, I just installed the motor mount on the front head loosely with two grade 8 7/16" bolts BEFORE installing the head on the cylinder, then tightened them after the heads were torqued down. I decided against using a stud since I felt a bit lazy in the mind that day. As far as gaskets, I used standard H-D gaskets for the most part. 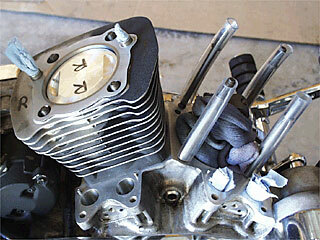 The exception was the use of the Bartel's copper head gasket (top-end gasket) kit. I did not use the Bartel's Aluminum base gaskets. The H-D base gaskets with the print-o-seal was used since there is a slight lip where the two halves of the case meets and I fully agreed with Maurice's "feeling" that the H-D base gasket might seal better than the Bartel's Aluminum gasket. NAPA copper gasket spray was used for the Copper head gaskets, and Gaskecinch everywhere else - except the base gaskets since they already had the print-o-seal. The main thing is: USE NEW GASKETS! The front rocker arms are shown. I also installed the intake manifold before I closed up the front rocker box. 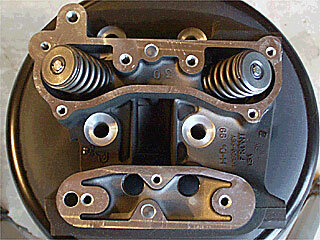 The pushrods are installed while the lower rocker box is loosely attached to the head. A wider view of the install prior to closing up the upper rocker box cover. It's starting to look like a bike again. The KuryAkyn breather - not attached yet. The Hypercharger goes over this get-up. No drippy oil air-box syndrome using this set-up. Finally! The moment of truth yields a low growling THUMP, THUMP, THUMP. Some minor idle speed adjustment, and the bike was ready for a test ride. 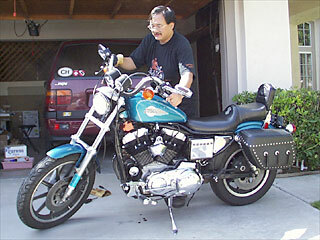 Before starting the engine, push the starter and allow her to turn few cranks WITHOUT spark plugs. This will allow some oil pressure to build. 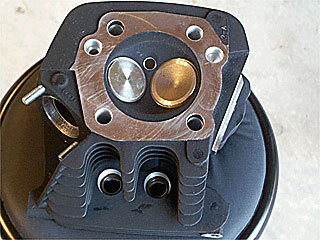 It will also allow you to feel air coming out of the spark plug holes giving reassurance that the pistons are pumping. And that WHOOSHING AIR - what a feeling! When the bike is first started up, it'll be making all kinds of louder than usual metallic sounds as the parts get lubed. Not to worry, it'll mostly go away after a few minutes. Then adjust idle speed and mixture if necessary. I adjusted the idle speed, but did not have to change the idle mixture (yet). Well, it turns out the 5/16" screw holding the front exhaust pushrod tube was not holding right since the heli-coil insert that was in there came out. So there was an oil leak from that area. I had an inde use a TimeSert bushing to fix that problem. The bike pinged. I also had a SE Programmable Ignition Module - basically a Dyna 2000 Programmable Module. Played with the advance curves and timing. Still had some ping. So I installed a '96 later SE Ignition module with 6800 rpm rev limit and QSE curve. What a difference! I'll report after a longer test period, but it looks like a good fix. Overall performance observation: There is a little tappet noise, but it's expected. The sound is very different. It's got a low GROWL (not a rumble) with a very noticeable THUMP-THUMP-THUMP instead of the potato-potato-potato that we are all accustomed to hearing. Nice smooth throttle response with torque through the rpm range. It really likes to be in the 2500+ rpm range. There is definitely more HP and torque available. Translation: The bike be FAST ! Photos were taken by my neighbor Andrea who takes digital images of items for a variety of applications for her business. She wanted to digitally clean up the background but I told her that if things looked too clean, bikers would get suspicious. BTW: There are a couple of poor quality photos that I took while Andrea was on vacation. She did a great job digitally enhancing them, but I think you can still tell which photos are mine.